The Greeks were familiar with some electric effects and coined the term electrik. There was little interest in those effects until William Gilbert distinguished electric and magnetic properties in his book de Magnet published in 1600. (Gilvert was born 1544 in Colchester, became prominent physician to the Queen, died 1603; shown at right from title page of de Magnete.→) Thereafter electric sparks and their effects became the rage at royal parties in Europe. In 1734 C.F. de C. Du Fay (b1667, d1736) distinguished different types of electrical effects produced by rubbing glass and resins. Du Fay called the two types vitreous and resinous. Benjamin Franklin (b1706, d1790, ←portrait at left), believing the effects due to a single kind of electric fluid either in excess or deficiency, renamed electric charge to be positive and negative. Franklin observed that sparks seemed to jump from glass rubbed with silk to sealing wax rubbed with wool. So Franklin called the electricity from glass (previously called vitreous) positive and that from wax (previously called resinous) negative. Investigation of the electrical aspects of chemicals was hampered until 1800 when Alessandro Volta (b1745, d1827) developed a pile of plates alternating two metals with discs of paper or leather soaked in saline solution. Volta's pile provided a reliable method of producing steady current for further research. Numerous investigators used Volta's pile to cause chemical changes, separate substances, and discover new elements. 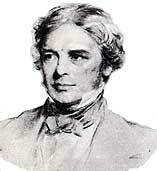 Berzelius suggested that all atoms have different amounts of positive and negative charge. He arranged the atoms in a series from potassium, the most positive, to oxygen, the most negative. Atoms stick together electrically to form compounds. Compounds have residual charge allowing them to form more complex salts and hydrates. The theory maintained that diatomic compounds of identical elements such as required by Avogadro's hypothesis are impossible. Electrodes: where exchange of electrons occurs. Ion: electrically charged atom or group of atoms. Anion: ion with negative charge. Cation: ion with positive charge. Anode: electrode where oxidation occurs. Cathode: electrode where reduction occurs.